The bestselling author of The Best Democracy Money Can Buy offers his most provocative and funniest book yet! Before invading, George Bush didn't have a secret plan to seize Iraq's oil -- he had two. Palast shows you both. In 'Who's Afraid of Osama Wolf?,' Palast reveals the horror and humor of the War on Terror. In 'The Network,' Palast gives you the skinny on the new global order -- and pushes Thomas Friedman over the edge of his Flat World. It was Palast, for BBC TV, who first uncovered how Jeb Bush and Katherine Harris stole Election 2000. Now he tells you that Kerry won in 2004 -- and that 2008 is already fixed. Who drowned New Orleans? Palast names names -- and adds some suggestions for fighting the new Class War. Greg Palast speaks truth to power the only way you can -- by letting the facts speak for themselves. Get the straight story on what today's self-appointed Masters of the Universe have in store for you. The book details many of the down sides of the Bush presidency, going back to many documented and some new reports of election fraud from the 2000 and 2004 elections. Some of the economic theories and free trade discussions need a little more explaination, and other policy failure discussions of the past eight years have been discussed enough over the years so that it's no longer breaking news. Book has become somewhat dated following the 2008 election. Obama is in, and Bush is out, and it's time to move on. Palast, previously a corporate fraud/racketeering investigator, is currently an economist/investigative journalist for the BBC, and the British paper "The Observer". The stories he investigates are mysteriously getting little to no exposure in the US press, which I find alarming. I am astounded that companies like ChoicePoint are still operating, and that the voter fraud that they have contributed to isn't under serious investigation. This seems gargantuan compared to things like Watergate, and nobody seems to be doing anything about it! This book just isn't just about ballot spoilage though, and covers other frightening topics, such as the erosion of workers rights, and the fact that other than the top 5%, most Americans are making LESS than they did even a decade ago. It is a pity he has such a bombastic personality - which definitely comes out in his narration. However, as he says himself, he's not out there to be anyones "friend". Perhaps that's part of of his charm. 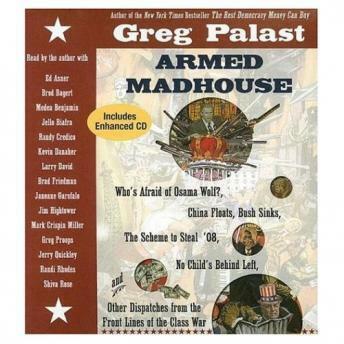 Greg Palast wrote an important book, but he would do well to stop self-narrating his own material. His chip-on-the-shoulder tone-of-voice makes it hard to keep listening at times. It's too bad because this jeopardizes his impeccable research and reporting. Chapters on the fixed 2004 election, the neo-con plan to seize Iraq oil in the name of price fixing, and the drowning of New Orleans as tactic in class warfare are interesting enough to speak for themselves. Palast's pen is a mighty sword. But he should stick to writing and zip his lips. Or call the book "Armed Madhouse" but change the name of the audio to "Armed Mad Mouth".